I have a feeling that trade policy is going to be a major topic of discussion between now and November 2016. This is a reposting, with minimal updating, of a 2010 comment on trade issues, and I will have others to follow. In 1974, when we were waiting in line to buy gas on alternating days depending on our license tag numbers, we should have known that everything was going to be different after that. The days of low cost energy, robust economic growth, and balanced trade for the United States were over. It is to the theoretical advantage of the world economy for countries to trade with each other because the law of comparative advantage allows countries to specialize in doing what they do best. In an ideal situation, a country collects enough money from the export of goods to other countries to pay for goods it imports from them. The United States is not in an ideal situation. In 2015 the value of our exports totaled $2.25T or 12.6% of GDP. 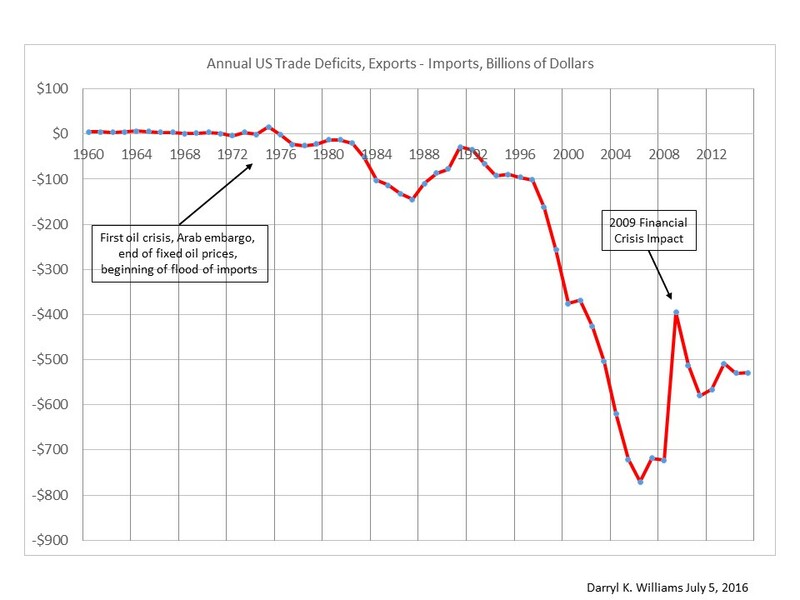 Imports totaled $2.78T or 15.5% of GDP. When such an imbalance occurs, as has been the case for the USA since the late 1970’s, the countries that accumulate dollars spent by us have three options. They can sell them in currency exchange markets and drive down the value of our currency. They can invest in property and companies in the United States. (Remember how upset we got when Japanese companies bought Rockefeller Center, Firestone Tire, Columbia Pictures, and the Pebble Beach Golf Club in the late 1980’s?) Or, rather than investing directly, they can just loan the money to the USA by buying US Treasury bonds. That seems to be the current strategy of the Chinese. And, when we borrow that money, what do we do with it? We spend it, probably on more stuff from China. And then they can loan it to us again. We should invest it in a global stock index fund instead of recycling it through the Chinese economy. 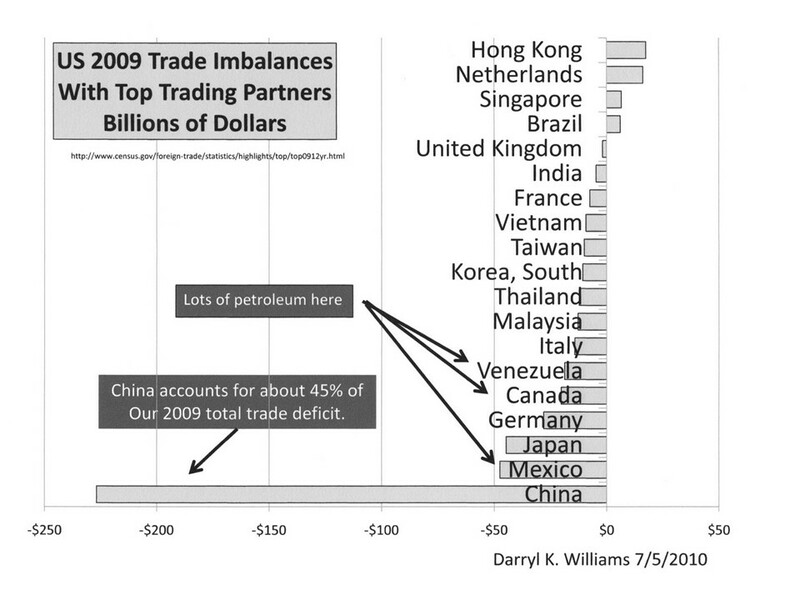 China is one big problem driving our trade deficit, and the other is oil. 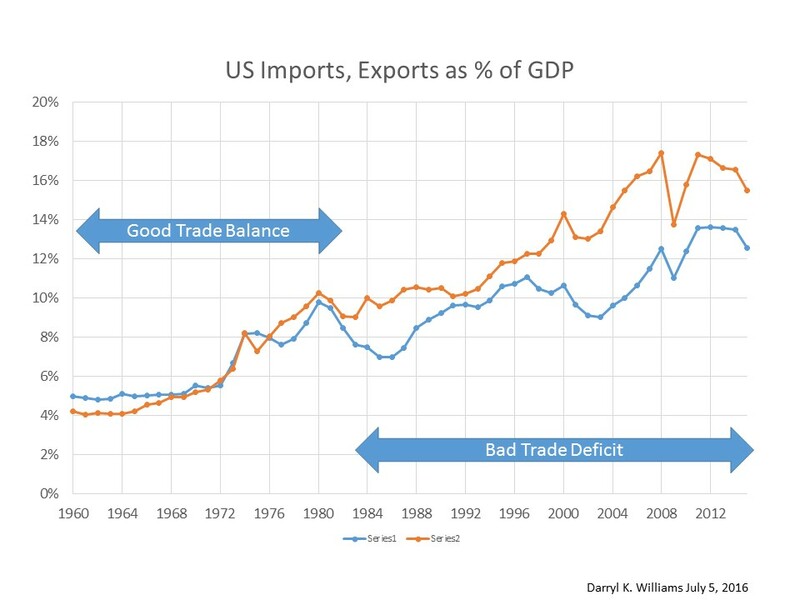 Of the total deficit, about half is due to crude oil imports and about a third due to the imbalance with China. The oil problem began in 1974 with the first oil crisis and freeing of the crude oil price from control at $3/barrel. As our demand increased exponentially, our environmental restrictions on drilling in the US expanded, OPEC conspired on pricing and production levels, and we paid the price. And by the way, our GDP growth, as a result of these changes, has been minimal since 1974. 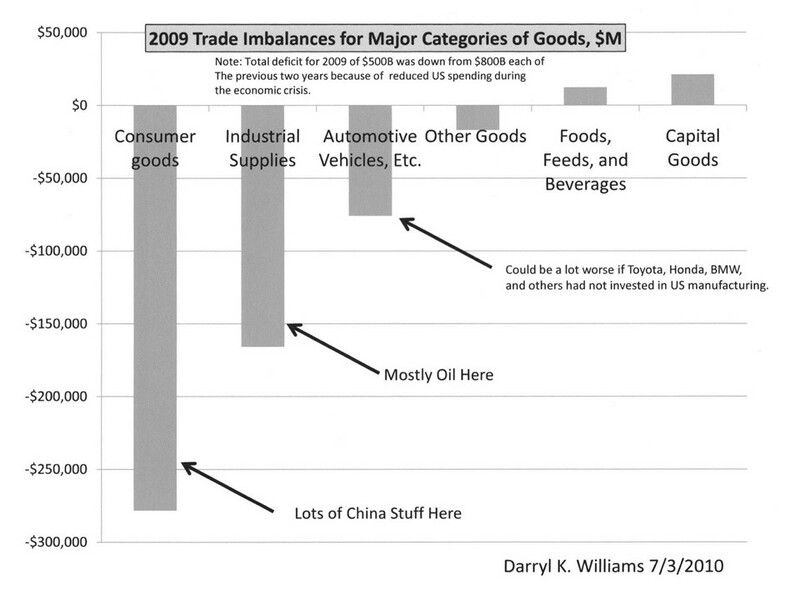 Here is the history of our trade imbalance problem. The China problem is probably going to diminish as the Chinese people demand more ability to consume what they produce and their government responds with concessions on the relative value of their currency. In a few decades there will be more wealthy people in China than there are people in the USA and they will be looking to the USA as a source of cheap manufactured goods that our own citizens won’t be able to buy. But that expansion in China is only going to make the oil problem worse which is why we need to quit being so self-righteous about not drilling for and using our own oil and mining and using our own coal while continuing to demand more and more of the gooey and smoky stuff and the products made from them. We need a plan to improve energy efficiency and to use every ton of coal and every gallon of oil and every cubic foot of natural gas we can find in the USA to reduce imports while we build nuclear plants ASAP with the money saved. Yes, I favor solar and wind and geothermal and hydroelectric power and hooking exercise bikes up to power television sets when practical, but nuclear is the only way to make a significant difference in the next 25 years. France, a country with no oil fields and 76% of its energy coming from nuclear power plants, has set the example, and we need to learn from them.